Thanks to increased awareness, the number of new cases of HIV/AIDS nationwide began to fall after 1985. However, in some cities, such as San Francisco, the number of new cases continued to rise. Although the statistics were alarming, many IV drug users did not want to quit and few viable options were available to help this vulnerable population. Like many, the Comer family followed HIV/AIDS news as it gained media coverage. When a man named Dave Purchase appeared on a news program talking about syringe exchange as a way to curb the pandemic, he caught the Comers’ attention. 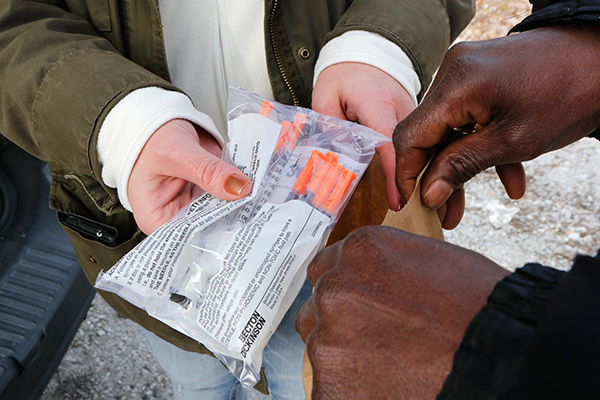 Through syringe exchange, drug users could trade a used syringe for a new, sterile one, therefore reducing the spread of HIV and other blood-borne viruses. To better understand the issue, Stephanie Comer reached out to George Clark who ran the San Francisco Needle Exchange. Comer volunteered at the organization and came to know the people these programs served. She also became intimately familiar with some of the biggest struggles of syringe exchange including chronic underfunding and the marginalization of drug users. Not only did drug users face severe social stigmas, but a ban on federal funding for syringe exchange also made it difficult to find support. The Comer family soon recognized they could make an impact on HIV/AIDS by focusing their funding on syringe exchange. Comer sought input from Clark and Dan Bigg, who also brought knowledge of syringe exchange and a budding concept called “harm reduction.” As the director of the Chicago Recovery Alliance, Bigg defined harm reduction as “…any positive change as a person defines it for him/herself.” He provided drug users with clean syringes and additional services that could help the community, such as free counseling and HIV testing. At a meeting at Comer’s home in October 1993, the three decided to bring together the nation’s leaders in syringe exchange and dubbed the group, the Harm Reduction Working Group. 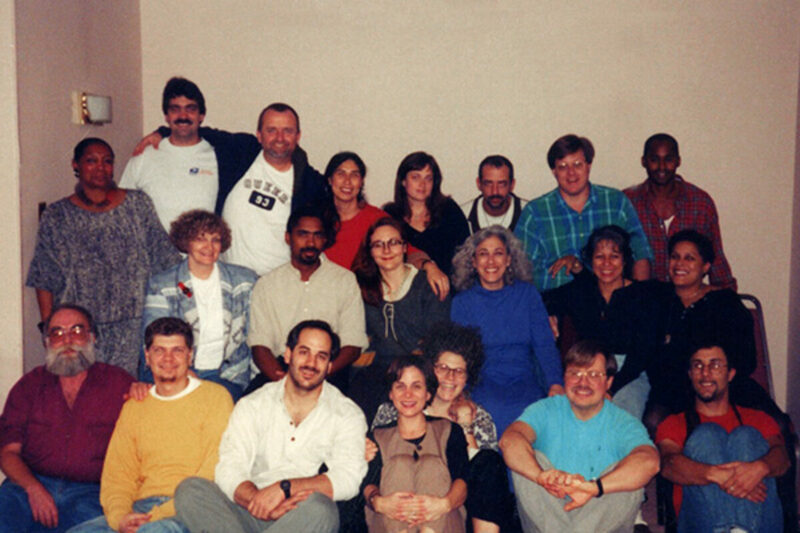 The first Harm Reduction Working Group meeting was held in San Francisco in 1993. In addition to Stephanie and Francie Comer, George Clark and Dan Bigg, participants at the first gathering hailed from different backgrounds and included Dave Purchase; George Kenney from Boston; Imani Woods, an advocate for harm reduction in African American communities; Jon Paul Hammond founder of Prevention Point Philadelphia; Renee Edgington, the pioneer of Los Angeles’s needle exchange; Heather Edney from Santa Cruz Needle Exchange; Bay Area public health advocates Delia Garcia and Sara Kershner; Edith Springer; founder of NY Peer AIDS Education Coalition; and Joyce Rivera, who founded SACHR in the Bronx. “The group was diverse, but we were all of one mind that we wanted to do something good to prevent the continuation of HIV/AIDS,” Rivera said. “In 1992 and 1993 when you worked in a city with injecting drug users, you were rubbing shoulders with the face of AIDS. All of us in this field were outraged by the tragedy that was afoot and the willful ignorance that characterized policy toward [drug users].” Over four days, the group began the challenging task of creating a unified definition of harm reduction, coming up with a mission for the working group, and addressing common concerns. The San Francisco group was joined by more participants as they all felt that the essence of harm reduction was not an expert-based undertaking but rather a process of listening. A subsequent meeting was held in D.C. in the Fall of 1995. From these meetings emerged the idea for a nonprofit called the Harm Reduction Coalition. Initially led by Clark in San Francisco, the organization eventually moved its headquarters to New York City, where it is now headed by Allan Clear. Over two decades later, Harm Reduction Coalition has grown into a national advocacy and capacity building organization that promotes the health and dignity of individuals and communities impacted by drug use. The organization now has an East and West coast office, and hosts a biennial conference that gathers practitioners, researchers and providers of harm reduction for sharing of best practices, resources and updated research.